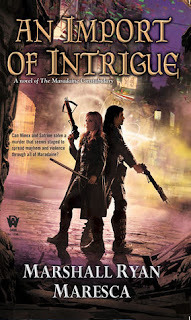 An Import of Intrigue is the second in Marshall Ryan Maresca’s “Maradaine Constabulary” series. The first was an entertaining investigative romp, with a hard edge of noir under the surface of the narrative - so I went into the sequel with reasonably high expectations. In short, this sequel matched my expectations, and more. We’re back in the city of Maradaine, a thriving and at least notionally cosmopolitan metropolis. Here, people from all corners of the world can come together to sell each other overpriced trinkets, tobacco, or move large quantities of industrial goods. Maradaine has a feeling of vitality about it, as people cross behind our protagonists – moving goods, committing the occasional crime, making money and living lives. This particular instalment of the series focuses on the Eastern quarte r- itself far more of a cosmopolitan environment than we’ve seen before. Here sit the outsiders, the immigrants from different lands, huddled together in enclaves with varying degrees of power, demarcated from the citizens around them. Character-wise, we’re back with our dynamic duo. Minox “Jinx” Welling is perhaps a little more tired than before, a man trying to get a handle on having access to magic, but not having any training in how to handle it. I wouldn’t say he’s thrown caution to the winds in the pursuit of magical understanding, but the drive to resolve this issue is definitely visible on the page. He’s a man driven by a sense of duty, blended with a near pathological need to solve puzzles, which can draw in all sorts of trouble. He’s shifted into being a little more aware of others as social beings, as well, perhaps under the influence of his partner – but is still charmingly, stubbornly, entertainingly obtuse. He’s helped in a way by his family, a sprawling unit of slightly eccentric uncles, cousins and closer relatives, all of whom will club together to yell at the erros of their own, and then turn on outsiders if they also point out those errors. By contrast, Rainey, his partner, is a woman with a firm grasp of people. Or at least their elss well represented areas. She continues to be an angry, focused individual, as driven to solve cases as Minox, but with a sharper edge to her questioning, and perhaps a greater willingness to get her knuckles bloody in pursuit of the truth. Rainey’s relationship with her husband and daughters features again here – and the reader can see a woman with a fully fledged career and a family expertly portrayed here. There’s love, there’s concern and worry, anger and disappointment, pride and joy. But it all seems like it fits together. We get to see a little more of her mysterious past, as well, and it’s interestingly presented, and well worth the effort. The plot is a sort of fantasy-noir, an investigation filled with charmless antagonists and multiple red herrings. There’s the occasional fast-paced action sequence to break up the flow, and these are typically fluidly kinetic and rather entertaining. The investigation itself is a slow burner, which ratchets up the tension over the course of the narrative, before a somewhat explosive conclusion. The blend of fantasy and noir works wonderfully, a hard-boiled investigative mystery, with thrills and spills within a unique and well imagined world. 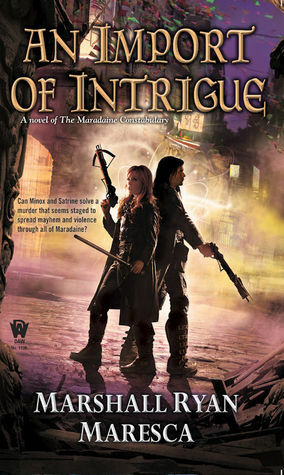 If you’re looking for a new detective series mixed with fantasy elements, this is a great choice – and if you’ve already seen the world of the Maradaine Constabulary, then this novel will only reward your attention.